Every month I dedicate a whole day for cleaning my bathroom and a beauty room and find the space for new products I’ll be testing. There are a few products though that never seem to leave the shelves as I keep coming back to them repeatedly. Today I decided to share with you a roundup of 5 skincare products that I always have on rotation as I simply can’t get enough of them. But before we begin, let me say a few words about the hooded bathrobe I’m wearing in these photos. It’s from Alexander Del Rossa, a high-quality loungewear brand available on Amazon. Ever since I received this luxurious hotel-style white robe, it’s my favorite after-shower attire. You could hide your wet hair under the hood and get it air-dried while working on your nighttime routine. It’s such a live saver for a busy girl like me! I’m happy to share with you an exclusive 15% off promo code on all Alexander Del Rossa: look for products via this link and use the code KATYA115 at checkout. Happy shopping! I stopped using this rich moisturizer during summer, but with the beginning of the cold season, it’s back to my beauty room. Until this moment, I was not able to find any other moisturizer that offers such level of nourishing to my sensitive dry skin. It takes practice to learn how to make this thick cream to absorb into your skin, but once you nailed it you’ll be surprised how dramatically it changes your skin. It’s the third large size jar of Crème De La Mer that I use and I must say that the famous “miracle broth” really work! If you are into face oils, you’ll love what this skin recovery concentrate does to your skin. Each portion of the product packed in a compact and adorable-looking ampoule that delivers all the best ingredients to make your skin visibly brighter and less irritated. Apply it under your night cream or use in a combination with Estee Lauder Advanced Night Repair Serum to achieve a healthy radiant look, even if your skin is struggling from changes of seasons or weather. While writing this post, I’m officially over the entire jar of this miracle mask. To be honest, this product became a true obsession of mine: I can’t get enough of how my skin feels the morning after I applied this luxurious face mask so I perhaps overuse it. Every time before an important event I apply my sleeping mask and wake up with the softest and smoothest skin ever. If you ask what is my number one secret for good skin for girls over 30, that mask would be it! If you are wearing makeup daily, this Acacia Honey cleanser is a must. It features a unique transformative texture that at first feels like dry oil and then dissolves into a soft velvety foam that effortlessly removes makeup and doesn’t clog the pores. In comparison to other oil-based cleansers, this one doesn’t leave your skin feel greasy and could be used not only at night to remove makeup, but also in the morning to prepare your skin for the day. It’s not fair to include this shimmering body oil in this guide because it’s currently sold out, but I’m using it so often that I can’t just hide it from you! My friend Kimmy taught me a trick of how to make your legs look better in photos and it involves applying this dry body oil and following with my favorite highlighter – so if you are all about natural, sun-kissed glow, try finding this body oil from resellers! 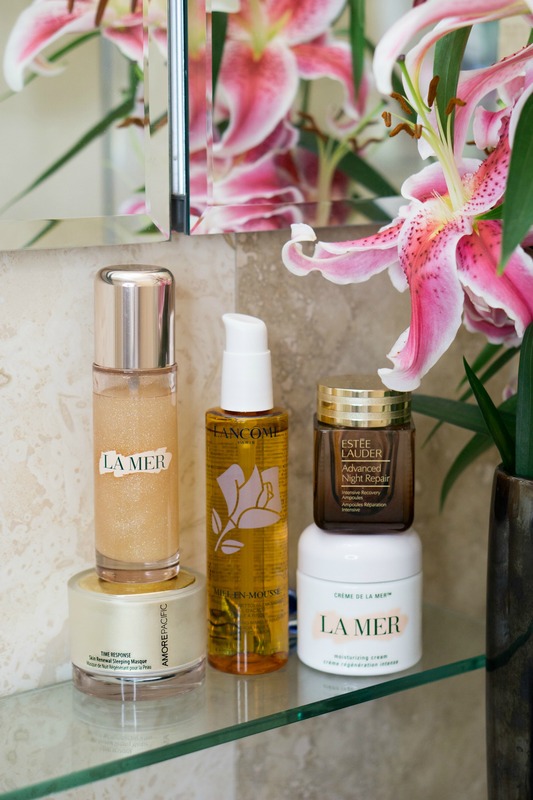 Of course, these are not all luxury beauty products that I currently can’t get enough of, but they are on top of the list. Please comment below if you are interested in learning more about luxury skincare products that caught my attention as I’d be delighted to share them in a blog series. Also, please let me know what are your current favorite luxury skincare products! Disclosure: This post is brought to you by Alexander Del Rossa.